Are you looking for a nice summer salad to help beat the summer heat? Well I think this Black Bean and Corn Salad just might be your answer. t's colorful, delicious, and a snap to throw together. Making it the perfect dish to take to a barbecue or picnic. The best part about this recipe is that it can be made ahead of time and kept in the refrigerator for several days. The longer this salad sits the more flavorful it gets. I found this recipe filed away in an old recipe folder. From time to time I print off recipes that I want to try and then file them away. Well, sometimes I forget about them and that is exactly what happened in this case. I am so glad I came across this recipe and finally tried it. I have actually made it twice since finding it because it's that yummy. I did tweak the recipe just a bit to add a little more flavor. I have to admit my new love is for black beans!!! What I love most about black beans is how versatile they are. Black beans have a nutty flavor with a velvety texture. They also hold their shape really well making them the perfect bean for salads and salsas. Speaking of salsas not only is this recipe a great salad, but it also makes a wonderful yummy appetizer. My favorite way to serve this salad is on a pretty chip and dip server surrounded by tortilla and pita chips for dipping. If you want to turn up the heat a bit try adding a chopped jalapeno or two. My daughter was enjoying this salad with me so I chose not to add it this time. Black Bean and Corn Salad is pretty to look at as it is good for you. With that being said I hope you will give this recipe a try. 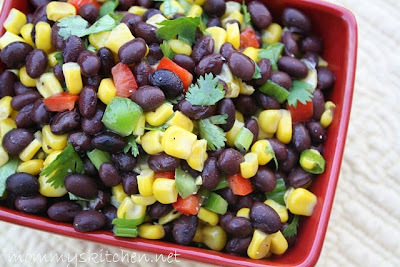 Well everyone it's Potluck Sunday again, so today I will be bringing this yummy black bean and corn salad to our potluck. Do you have a recipe you would like to contribute to the potluck? If so then link directly to your post not your homepage. 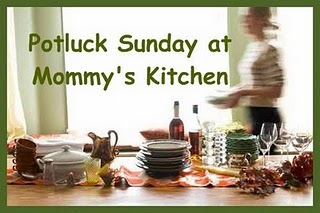 And please include a link back to Mommy's Kitchen so everyone can see all the delicious recipes. I cant wait to see what everyone is bringing. Cook and cool corn. Dice and chop up all the vegetables and set aside. While the corn is cooling whisk together balsamic vinegar, olive oil, lime juice and salt and pepper to make a dressing. To the dressing add the drained and rinsed beans, corn, onion, bell peppers and cilantro toss until just incorporated. Cover and chill for at least 2 hours. Serve as a salad or an appetizer with tortilla or pita chips. The longer this salad sits in the refrigerator the better it taste. I’m excited that I have entered into a paid, formal partnership with Bush’s Beans but the post above isn’t a part of that agreement. I just love this recipe and couldn't wait to share it. If your looking for more great Bean Inspiration visit: Beans the Vegetable with More. Mmm, that's my kind of salad. We've eaten a lot of that kind of thing this summer. Perfect for summer. Nice and fresh. Thanks for hosting Potluck Sunday. So so good!!! I could eat this whole dish up myself! I love Black Bean and Corn Salsa! YUM. I will have to try this--it sounds really good! Black beans are so good for you, too! That sounds really good. I love black beans! 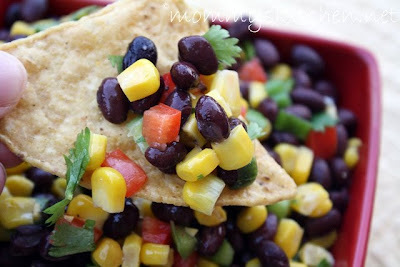 I make an awesome Black Bean Salsa that is very similar to this. Thanks so much for hosting! That salad looks super! Great lookin' salad Tina! Thanks for the Pot Luck Linky! This looks delicious! I just found your blog this morning and I'm so happy I did! You have my type of recipes, dishes my Southern family will love. I've signed up to get all your posts. I can't wait to try some of your recipes. Thank you for sharing. 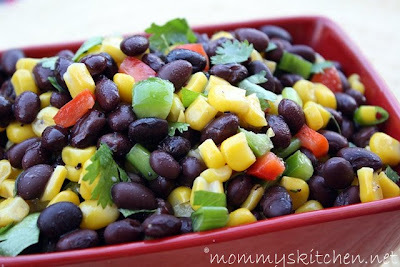 I love anything with black beans and corn together so this a must have recipe for me! Oh that sounds so good! It's the perfect potluck kind of recipe! My biggest breakfast dilemma is coming up with something good tasting with protein to keep you going until lunch. We don't always want the eggs, bacon, etc. routine. My family and I thoroughly enjoyed this tonight and I think I may love you. I guess I'm your newest follower so will definitely be back! Making this salad tonight!! YUM thanks for the receipe!